Waller Hugh Paton was born in Wooers Alley, Dunfermline, Fife, the youngest son of the three children of Joseph Neil Paton (1797-1874). He began his career designing damasks for his father and then studied watercolour painting briefly in Edinburgh with John Adam Houston (1813-1884), but was largely self-taught. He was equally skilled in watercolour and oil paintings, his oils usually of a smaller scale. More often his landscapes were of mountains, lochs, and trees, with meticulously detailed rocks and plants. He was well known for his moonlit scenes and sunsets. He did sometimes include people, but they are usually small and incidental. There are very few paintings by Paton in public collections. His diploma picture, Lamlash Bay, Isle of Arran, signed and dated 1865, is in the Royal Scottish Academy, and the National Trust for Scotland acquired the oil Outlet of Loch Achray (exh. Royal Scottish Academy, 1859) as part of the contents of Fyvie Castle, Aberdeenshire, in 1984. Paton was a successful painter and large sums were paid for his work in his lifetime. 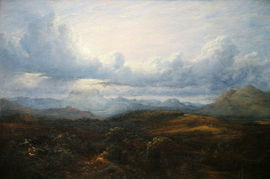 It is only in recent years that people have begun to recognize his undeniable quality, the mastery of his technique, both in oil and watercolour, and his sympathetic interpretation of the Scottish countryside.